Veganism is everywhere now. It seems that more and more people are turning to a more green way of life to better themselves and the planet. When you think vegan, the first thing that probably comes to your mind is food. Plant-based foods that contain no animal by-products, right? That’s not always the case! Simply switching your eating habits isn’t the only thing you can do! Many skincare, makeup and hair care products contain products derived from animals, making them unfit for a vegan. Beeswax and gelatin are both common cosmetic ingredients that aren’t suitable for someone following a vegan lifestyle. A lot of conventional brands contain animal by-products, so for someone that isn’t vegan, is switching to vegan beauty products really worth it for your skin? It’s well known that cruelty free and vegan cosmetics have fewer ingredients than conventional cosmetics. Many natural skin and body care products are packed with ingredients from nature like, shea butters, coconut oil and even hydrating and nourishing vitamins like vitamins A, C and E. These compounds all are great for helping with anti-aging, smoothing fine lines and reducing the appearance of wrinkles, along with so many other great things. No need for harming animals with these types of products! The vegan beauty industry is undoubtedly one of the fastest growing categories for skincare and makeup. More and more people are realizing that when you have great, natural products without harsh chemicals, your skin and hair will look and feel its best, naturally! When you make the switch to our luxurious, vegan friendly brand, Eluxe™, you will be aware of the natural, herbal and non-toxic products that our products are made from. The conventional brands can be filled with chemicals, including parabens, sulfates, and synthetic colors and fragrances that may be harmful to your skin. All of our Eluxe™ beauty products are certified cruelty free, vegan friendly and made in the USA. 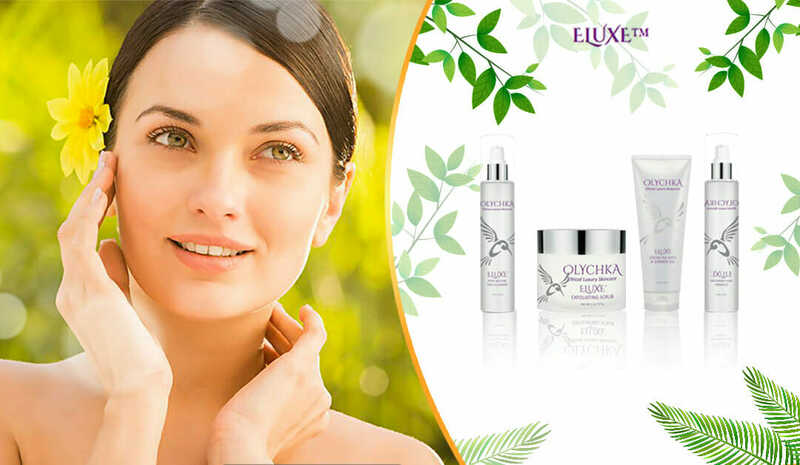 If it is important for you to know that no creature was harmed during the manufacturing of the your beauty products, then Olychka’s line, Eluxe™, is the right choice for you! Cleansing your skin is essential to any beauty routine, but some facial products can do more harm than good. Our vegan cleansers are ideal for people with skin sensitivities because of our non-irritating ingredients. The Pore-Restore Daily Cleanser is exceptionally gentle and the best vegan formula for a variety of skin types. Formulated without parabens, sulfates, phthalates or gluten, our pore cleanser can thoroughly clean and exfoliate skin, naturally. Made with natural ingredients like Witch Hazel, White Willow Bark and Tea Tree oil, you can guarantee our cleanser will deeply penetrate your pores while washing away impurities like makeup and oils. Great for combo, oily and acne-prone skin. Our high-quality, vegan Daily Hydrating Cleanser is excellent for gently removing makeup, dead skin cells, dirt, and oils. Formulated with cooling Cucumber extract to help soothe redness and Hyaluronic Acid to keep skin plump, this hydrating cleanser is perfect for anti-aging, mature skin and hyperpigmentation. The added B vitamins have anti-inflammatory benefits and can help with dry skin. Gentle enough to be used daily, it is certified cruelty free and vegan safe. The Daily Hydrating Cleanser is non-irritating and perfect for sensitive because it is formulated without parabens, sulfates, phthalates and gluten. Our skin can experience a lot during the day, so exfoliation is a must! Gentle on the face, our vegan Exfoliating Scrub is made with sustainable Bamboo Stem Micro Crystals and Pumice to buff away dead skin cells, revealing a smoother, brighter complexion. Our scrub is also made with powerful antioxidants like Green Tea and vitamins C and E to help keep your facial skin moisturized. Luxurious and non-irritating, this scrub is great for all skin types. Made in the USA and without parabens, gluten, sulfates and phthalates, the exfoliating facial scrub will keep your skin glowing! Green tea is great internally and externally! The Eluxe™ Green Tea Bath & Shower Gel is made up of 11 botanical extracts including soothing Chamomile, White Oak Bark, which is a natural astringent and the popular antioxidant, Green Tea, that helps promote DNA repair and reduces inflammation and redness. Formulated without parabens and alcohol, this bath & shower gel is non-drying and super moisturizing. Great for daily use, this gel will keep your skin looking fresh and dewy, all while locking in moisture for ultra hydrated skin. Our bath & shower gel is cruelty free and vegan friendly and safe for sensitive skin.